Your Southern Peach: What's Cookin' this Weekend? I plan on getting some cooking hours under my belt this weekend and I'm looking forward to sharing some recipes with you next week. 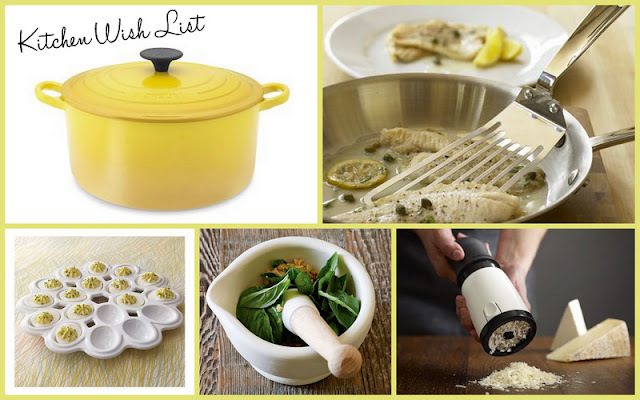 In the meantime, I've been thinking about some essentials that my kitchen is missing and while I try to keep kitchen gadgets to a minimum, I think these items would last me a lifetime. Don't you have a birthday coming up??? Give me sweet D's email and I will badger him to get the pot! I have one heart shaped Le Crueset pot and I love it! When I stop buying diapers, Im gettin me the big dutch! Love this post! The Le Creuset is on my birthday list :) Enjoy your weekend.